If you have played before Extreme Bike Trials, you will feel right at home with Dirt Bikes Super Racing. This time you are competing against the computer on a challenging motocross track. Try to beat the other racers and reach the finish line before anyone else. 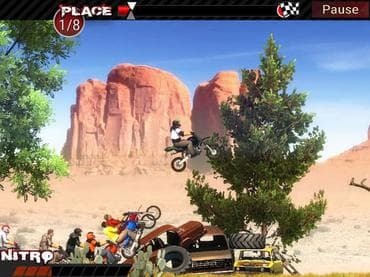 This 2D racing game features more than 30 levels and several unlockable motorbikes. Use the nitro boost to race past your opponents and position your driver carefully for the jumps. If you have questions about Dirt Bikes Super Racing game, please contact us using this form.